When Andrew Protenic looks back on the 2010 Missouri deer season, he’ll have quite a tale to tell. No, it doesn’t have anything to do with a huge buck. Or an extraordinary shot he took. Instead, his story centers on an animal he mistook for a coyote and shot — a creature that appears to be a wolf. For now, the Missouri Department of Conservation isn’t sure just what he killed — a wild wolf that had done some serious traveling or an escaped pet. Perhaps a wolf-dog hybrid. Resource scientists have collected tissue and hair for DNA analysis, and they’re contacting wildlife biologists from nearby states that have wolves to get a clue to where this animal came from. But one thing they’re certain of: This definitely isn’t the type of tale they hear often during the Missouri deer season. Protenic, 34, of Smithville. “I’ve hunted there in Carroll County for eight years now, and I know a lot of the people in the area. “No one I talked to has ever seen anything that looks like a wolf or talked to anyone who might have one as a pet. This is a real mystery. Protenic, who was properly licensed to hunt both deer and coyotes, realized he had something far different when he got down from the tower stand he was hunting in Saturday, opening day of the firearms deer season. He had seen few wolves before. They’re not supposed to be in Missouri. Though they long ago inhabited the state, they disappeared in the late 1800s due to habitat loss and unregulated hunting. Today, they’re listed as a protected species in Missouri. But wolves survived and even thrived in Minnesota. From there they spread to neighboring states, such as Wisconsin and Michigan. Still, wolves are listed as a federally endangered species in most of the lower 48 states. The last time a gray wolf was reported in Missouri was in 2001, when a young animal was mistakenly shot in Grundy County. That wolf had a radio collar and its origin was traced to Michigan. Could Missouri have attracted another wayward wolf? Missouri officials aren’t sure. But initial clues indicate it may have been a wild animal. The wolf, a male, weighed 104 pounds and appeared to be 3 years old, Beringer said. No form of identification — tattoo, ear tag or microchip — was found. Protenic immediately called a conservation agent and feared he might be in trouble. But no state charges are pending against the hunter. Wildlife officials expect DNA results to be back in about a week. Then they’ll have a better idea of what they have and perhaps where it came from. I had to slow down a bit when I read that the last wolf in Missouri came from Michigan. Wolves live on the UP of Michigan, which is at least 700 miles away from northern Missouri. That is a long distance. I’ve not heard of wolves dispersing that far from their natural range before, but it is possible. If a Michigan wolf can show up in Missouri, it could show up in West Virginia, which is even closer to the UP by 100 or so miles. My guess is that this is a Western wolf of some sort. Maybe it was once captive. Maybe it really did disperse to Missouri, which is actually part of the original range for red wolves, not 100 pounders like this one. 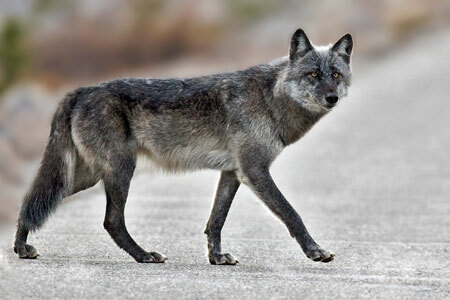 It would be amazing if this animal turned out to be a real wild wolf. Of course, the fellow who shot it might be in some legal trouble. This story reminds me of the 85-pound “coyote” that was killed in Massachusetts a few years ago. It turned out the an Eastern timber wolf that had dispersed from Quebec through Maine and New Hampshire into Massachusetts, where it took up sheep killing as a vocation. Of course, Minnesota has more wolves in it than any state in the Lower 48. It would make sense that a wolf from Minnesota could have worked its way through Iowa into Missouri. It makes more sense than Michigan. (I want that Michigan wolf in Missouri in 2001 verified. It’s an amazing story if it’s true.). But I remember reading something about the size of wolves in Wisconsin, which are the same subspecies of wolf that live in Minnesota. It is a kind of transitional subspecies that includes wolves from the East that have “coyote” MtDNA and wolves from the Plains that have normal wolf MtDNA. These wolves were averaging something like 70 pounds in weight. So I’m very interested to see what this animal is and where it came from. 104 pounds is a big wolf. Cannot understand why people go mad when a wolf kills some sheep. The farmers will get the missed money back from the govenrment, right? When it is not the question of staying alive anymore for a man, why to blame the wolf? He’s gotta do his living somehow, in this MANipulated world. Also, it is good to remember sometimes, that all the material we own, sheep or else, is just a loan from the nature. Man didn’t make sheep or dog, tho’ some claim so. Originally, there was “a dog of forests and mountains” and there was “sheep of mountains and valleys”. These animals were just like our domesticated forms of them, except that they didn’t want to give their lives just to please us. So there is a good evidence that our domesticated animals, like dogs or sheep are our slaves. Call them what ever you want, my pal. Actually, in the US, it varies what the state or local government will give. We have Defenders of Wildlife, which does compensate ranchers who lose stock to wolves and other predators. However, in West Virginia, everyone pays a tax on the dogs you own to the county. That money goes into a fund. If a coyotes, dogs, or bears kill sheep, the county pays for it. It’s a tax that is like public insurance for allowing dogs to free-roam, and in a culture that is deeply attached to foxhounds and coonhounds, that is very important. That is a very doggy – should say houndy, of course – state, that of yours.